Hello! My name is Nick. I purchased a Trailblazer about four months ago. It currently has about 30k on it. In spite of its age, it is in fairly mint condition. I am planning out a lift, which brought me here. So far, I was able get ahold of some 3" MarkMC front lift spacers. 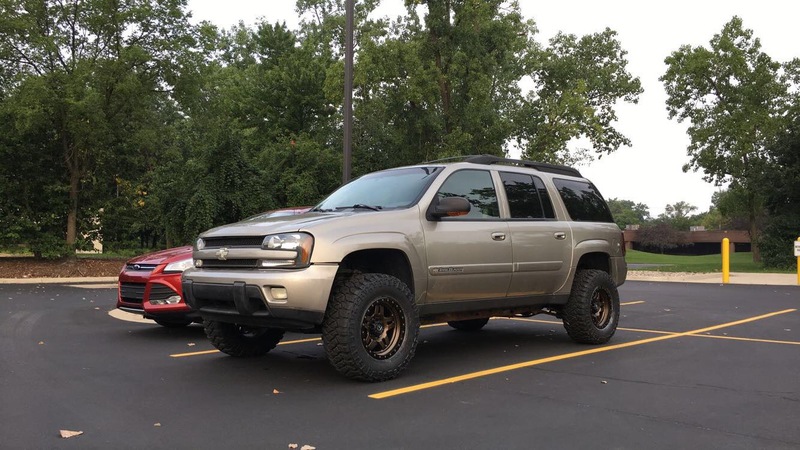 I purchased some Z71 rear springs. I also purchased some wheels and tires. The wheels are 17x9 -6mm offset 6x5.5 lug Black Rhinos. The tires are Cooper Discoverer A/T3s 275/70/17 load range E. I need to order some adapters still and some rear spacers. First I need to measure the front and rear fenders. In addition, I reached out to Radflo to see if I can skip the spacers and go straight to coilovers. I'll report back on what I find out. I'm still not sure how the 3" lift will look with my current wheel setup. If it will be too much gap. I've still got a ton more researching to do on here to do and some documenting. Can't really say they match the TB. How do you like them running boards. Welcome! Looks like you're in the mecca of off-roading in the US!! Jealous! I like those rims. They'd look even better wrapped in BFG KO2s. I'll likely never buy any other tire for my rig. I wish you luck in the pursuit of Radflos, but I believe they are finished with production for our vehicle. Lucky to get your hands on Marks lift, since he's stopped production, too. Glad to have you and we await some trip reports showing the beauty of Utah! yeah dude, those wheels are sick. welcome. Seriously though, I love those wheels, they look great. Sounds like you're on the right track with the lift. Like Bacon said, some of those parts will be hard to get a hold of now, but don't let that discourage you. I'm running the BDS 2" kit on my TB right now. Combined with some wheel spacers and I was able to run those same tires. My old Envoy had Mark's 3" kit, plus the Z71 springs and Moog 81114 front springs. You can check out the build thread for that one in my signature. Dudabadical wrote: In addition, I reached out to Radflo to see if I can skip the spacers and go straight to coilovers. I'll report back on what I find out. documenting. DirtyBacon04 wrote: Welcome! Looks like you're in the mecca of off-roading in the US!! Jealous! Thank you for the welcome greetings, everyone. I looked up those Ko2s and they do look awesome. For the very reason you explained, I'm going to try not to get my hopes up on getting some Radflos. I would be awesome if someone made a Base Cup to 14.1 eye adapter for the front or a replacement yoke. From what I can see, that would really open up some options. However, I'm not really sure how safe that would be. I've followed up with Radflo and even though they confirmed the stock size will no longer be produced, they did request me to send over measurements for what might work on a custom setup. (I'm wondering what the price might be on that.) They asked for compressed and extended. It looks like something within these ranges would be best. Compressed 4.8mm-5.8mm and Extended 24.37mm-26.2mm. I'll post an update for what comes of that. For now, I will probably go the Bilstein/Moog route in front and the Fox in back. Also. I'll try to provide as many details on my build as I can. If you happen to see me missing any helpful info, please let me know. I'll post over in the wheels section for now. I've got a spacer/fitment question. I don't even know where to start with the armor. We are crazy lucky to have BartonMD out there. I'll reach out to him right away. I guess I should already be planning that into my front spring choice. Last of all, I'm pretty sure there is a space up in the attic that is just begging to store those running boards. Thank you for the recommendation. I checked in with Hawkeye. Fortunately for him, he already sold them. He replied back to let me know. ...The search continues.